And also her convo with Cole Sprouse! We're calling it, Janina Vela is the luckiest fangirl alive! 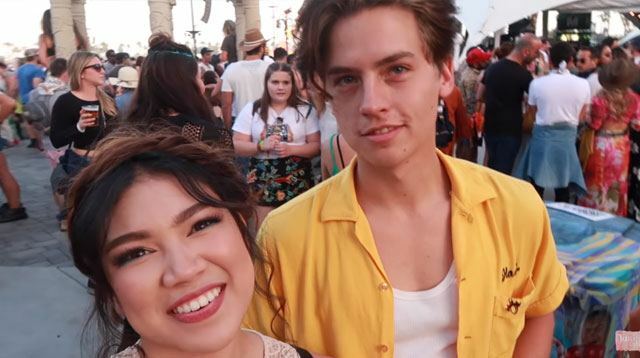 She flew to Coachella for a sponsored event and—surprise, surprise—met the cast of Riverdale and, more importantly, her "first celebrity crush ever" and the only boy whose photos are saved on her phone, Cole Sprouse! Janina was with her friend Yassi who saw Ross Butler first. "She held me so tight and said, 'Oh my gosh, I just saw the guy from 13 Reasons Why.' When her friend said it was "the guy who's also from Riverdale," Janina realized her friend was talking about Ross and decided that she needed her photo taken with him. Since her friend felt shy, Janina decided to go by herself, but because there were so many people she lost sight of him in a matter of minutes. It turns out it was just the universe's way of setting her up for the best day ever! "I found him again after a while. I saw him getting beer, and I felt shy, so I waited for him to finish." Ross was on his way out when things got more exciting. "I saw Lili Reinhart [who plays Betty on the show] coming, and I saw Camila Mendes [Veronica], and I saw everybody, and I'm like, 'Oh my gosh!'" Janina freaked out (as anyone else would), but didn't let it get the best of her. "I had to get my picture taken with them and they were like really, really nice about it. They commented nga on my vlogging camera saying, 'Oh my gosh! What is this contraption?' and I'm like, 'I'm actually a vlogger from the Philippines. Can I vlog with you guys?'" And they agreed! Mind you, this all went down without her first celebrity crush yet, so imagine her surprise when she saw Cole Sprouse later that day. "He was so sweet and I got a separate vlog with him. He was really, really nice about it and we had this whole conversation about my contact lenses, random things like that." Cole: "You're wearing contact lenses. You can see my secrets." Janina: "Yeah, I know all of your secrets." And Cole being Cole, "he went so close to my vlogging camera and he was like 'no, you all don't know my secrets.' He was so funny! He was so cute, I called him Zack and he was like, "Wow, nice try." Janina's now back in the Philippines, but she still can't get over what just happened during that Coachella weekend. "It was so crazy, super surreal. I still can't believe it happened. There was a 50/50 chance [of meeting Cole] but you know, I found him. I have to look at the picture daily, every hour, but yeah it was good." We totally get you, Janina!